Get Financing No Social Req. 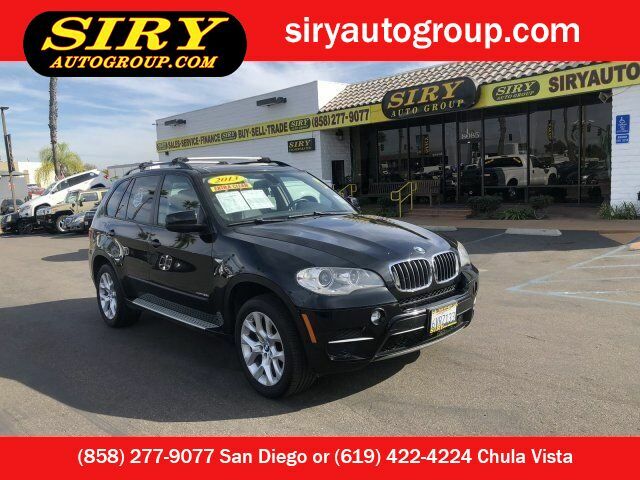 SIRY AUTO GROUP Is Offering A ~*ONE OWNER*~ 2013 BMW X5 xDrive35i AWD ~ There Is Nothing Like A Beemer ~ If You Want A Vehicle That Looks Utilitarian But Doesn't Drive That Way, You Can't Do Much Better Than The X5. Rides & Drives Like A BMW Sedan, Multiple Drivetrain Choices, Top Safety Scores, High-End Cabin Furnishings. Excellent Crash-Test Scores, Commendable Performance, Ride & Handling, Great Build Quality & Craftsmanship! From The Editors @Edmunds.com. This Is A Fantastic Deal & A Must See! Don't Wait ...Come In Today & Check It Out. Also Get EASY FINANCING While You Are Here! If You Are Searching For The Right Vehicle At The Right Price, We Will Be Your First & Last Stop! With Five Locations & Our Huge Inventory Of Just About Every Make & Model We're Able To Provide Our Clientele With An Incomparable Selection Of Beautiful Pre-Owned Vehicles. Please Call Today & Save! (Kearny Mesa - 858. 277. 9077) or (South Bay - 619.422.4224). *** We Work With All Major Banks & Also Offer Credit Union Lending. We Specialize In Challenged Credit & Will Gladly Work With You Directly To Secure Special Financing To Help Accommodate Any Credit Scores & History. Please Feel Free To Contact One Of Our Finance Specialists Directly. We Are Open Seven Days A Week. SE HABLA ESPANOL!